Much has been written on electronic signatures. In this article, we would like to present a simple guide on e-signatures and what makes them legally binding. In the modern world, everything has digitalized with time. From online shopping to automation of complex business functions, everything is digital today, and it lays the foundation of our future as well. One of the things that has become popular is electronic signatures or e-signatures. However, because it appears to be easy to sign a document online, many are often concerned about the legality of e-signatures. Does the e-signature on a legal agreement give the document any legal status? The first thing you have to know is what an e-signature is. Just like your inked signature, signing documents online is a way for you to sign documents, except that e-signatures are multi-dimensional. There are many ways for you to do it. You could use an e-signing tool that gives you the ability to sign a document with a mouse click or draw your signature on a digital document using a mouse. The presence of such a signature on a document may or may not give it a (stronger or weaker) legal status, depending on various factors that you will read later in the guide. The legality of electronic signatures. Now that you know what e-signatures are, you must be wondering about their legality. Yes, you could put an electronic signature on a document but does doing so make the document legal? Electronic signatures are legally binding in thirty European countries, the United States and the vast majority of countries around the world. An electronic signature can carry the same weight and legal effect as a traditional paper document with a pen and ink signature. #1 WHO: Who has signed? This is the part where the identity of the signatory must be verifiable. There are a number of methods that can be used to perform identity verification such as using verification via SMS, email, electronic ID, for example, BankID in Sweden. The stricter the identity control there is in the method, the higher the security the method offers. On top of this, a lot of information about every request made to the document or contract are saved and logged. It is important to remember that none of these identification method is 100% secure, even though digital is almost always better than the analog alternative! #2 WHAT AND INTENT: What was signed? The next part that affects the legal status of a signed document is the content of the document and the intent of the parties. What was signed? Did the parties invite to the contract intend to sign and legally commit to the document? This is where the contract content and what the parties stated in the signed version of the document matter. If a contract changes before being signed, then the new wording becomes a new contract offer. If there is more than one party invited to sign the document, then the contract is only signed when all have signed, thus agreeing on the common content. #3 INTEGRITY: Has the document been changed or tampered with after signing? The final part that is important to determine the legal status of an electronically signed document is the integrity of the document after signing. This means that after the parties have signed the document, it must be kept intact and not be modified or tampered with. By using an electronic signature based on PKI, the document gets hashed and signed using an asymmetric encryption key pair. The integrity of the document is thereby protected so that even a slight change in the document, e.g. change of a comma, a point or space, would create a different hash value, thereby revealing that a change has occurred. What determines the legal status of an electronic signature. Qualifications for an e-signature to be legally binding. As you can tell by now, not every electronic signature will be found to be legally binding. Obviously, you cannot just take a picture of your signature on a piece of paper, crop it, and paste in your documents to use it for making the documents “legal”; this method will not provide any decent level of evidence as someone else can easily copy-paste it from your document to another document. The legal value of an electronic signature will depend on its ability to prove who applied it, the identity of that person and that the signed data has not changed after signing. The levels of signatures described above are described in more detail in the eIDAS (electronic IDentification, Authentication and trust Services) Regulation of the European Union. eIDAS is a comprehensive regulation dealing with electronic identification and trust services for electronic transactions in the European Single Market. In the US the ESIGN Act is regulating e-signatures on the federal level. Oneflow follows the standards and best practices set out in or following from the eIDAS regulation, with the aim to make contracts signed with us secure and legally binding in all countries in the European Single Market. There are different levels of electronic signatures according to the eIDAS Regulation: SES (Simple Electronic Signature), AdEs (Advanced Electronic Signature), and QES (Qualified Electronic Signature). The definition of an Electronic Signature under Swedish and EU law means that “means data in electronic form which is attached to or logically associated with other data in electronic form and which is used by the signatory to sign” (eIDAS Regulaton article 3). As there are no specific security requirements laid down by law, it is not possible to determine the legal value of such signature without evaluating the method and security applied in the specific case. The eIDAS Regulation defines qualified electronic signature as “‘qualified electronic signature’ means an advanced electronic signature that is created by a qualified electronic signature creation device, and which is based on a qualified certificate for electronic signatures”. These signatures are advanced e-signatures but must adhere to certain EU standards (i.a. based on a so called qualified certificate), which means they offer additional protection controls over the advanced counterparts. You create this signature with the help of a device that’s specifically designed to create e-signatures. A court must normally admit these certificates the same legal value as a handwritten signature. Using a qualified seal with an electronic signature. All contracts signed with Oneflow are sealed with a Qualified Electronic Seal. 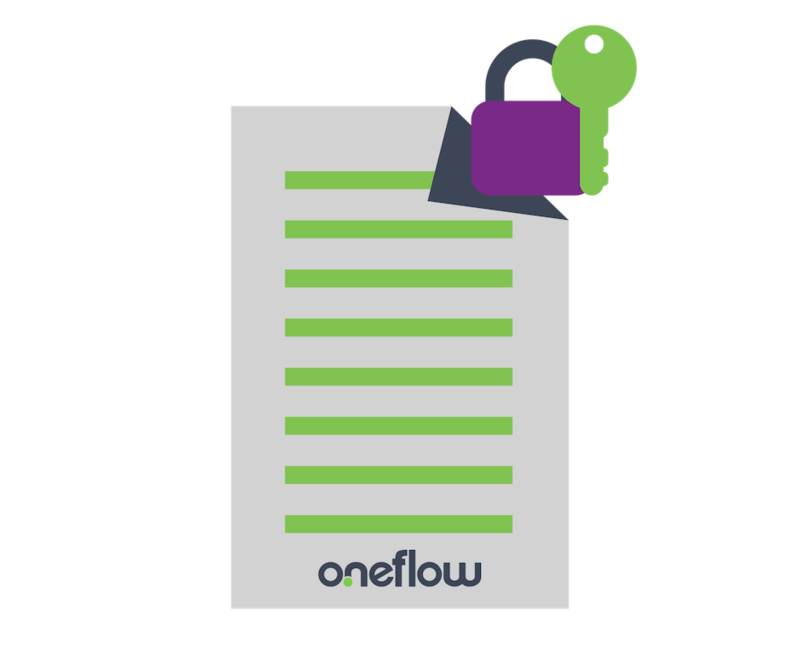 Once a contract in Oneflow has been signed in Oneflow’s e-contracting process by all signatories, Oneflow adds additional security and validity information to the contract bundle, after which the whole bundle is sealed with a Qualified Electronic Seal. As with electronic signatures, electronic seals also have different types according to the eIDAS Regulation: Simple, Advanced and Qualified. The principle is similar to that of the electronic signature level – the requirements of each level of the electronic seal build on the requirements of the level below it. A Qualified Electronic Seal meets the most requirements and a Simple Electronic Seal the least. The seal is there to prevent both intentional and accidental change the document after it was signed, meaning you and your counterparties can remain secure in the knowledge that what you signed today will remain verifiably unchanged now and in the future, even if that is 20 years away. The seal used by Oneflow is applied by its partner Trustweaver AB. How to verify the authenticity of an e-signature. When putting an e-signature on a document, you want to be sure that your signature is verifiable. What if someone tampers with your document after you have signed it? Here is how you can verify that you have signed the document with your valid e-signature. Use Adobe Reader to open the document you have your e-signature on. Look at the top and see if you can find one of these options. Option A: Your document does not have a sign on it even though the signatories have been identified by your e-sign service. Option B: The document is verified with the signature and the signatories too. However, signature verification will be difficult without your e-sign service. 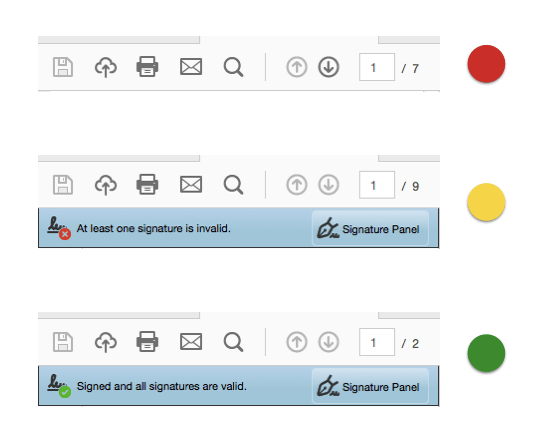 Option C: This is the best option that verifies your signature as qualified e-signature. That’s the most secure form of e-signature you can have today. More about verifying your e-signatures here. The key benefits of using electronic signatures. Imagine a scenario where you have to negotiate an agreement with a company located in a country on the other side of the world. The entire printing, signing, posting, etc. process will take days if not weeks. Once the recipient receives the documents, they will repeat the same process of printing the document, signing it, and posting it to you. This back and forth process is going to take a lot of time. On the other hand, you can close a deal within minutes using e-signatures. It lets you sign on the go. The modern world loves the idea of on-the-go. You should be able to do things while you are on the move. From shopping online to trading, you can do it all on your mobile phones today. E-signatures let you do the same i.e. you can sign the document regardless of where you are. Time is money, and with e-signatures, you can save a lot of it. In addition to that, think of all the paper that you have to waste to put lengthy agreements on. Unsurprisingly, some agreements can be tens of pages. That’s a lot of waste of paper and natural resources. With e-signatures, you can go paperless entirely. More about electronic signing here. Why choose Oneflow over other e-signature solutions. Oneflow provides independently verifiable contract electronic signature solution. This means that you can easily verify the authenticity of a signed contract without having to rely on Oneflow for verification. Say, if we disappeared from the planet, your signed document with Oneflow will still be verifiable. Sadly, this is not the case with most vendors providing e-signature solutions in the market today. Furthermore, for every contract that is signed, there is a verification document that follows authenticating the legality of the signature. In our opinion, however, offering a verifiable and qualified e-signature is the de facto of operating as a trusted e-signature vendor. What makes Oneflow different from traditional e-signature providers. What makes Oneflow have the upper hand over any other e-signature solution on the market today is its comprehensiveness. You might think of Oneflow as just another e-signature tool, but that’s not the case. When it comes to Oneflow, putting e-signatures on your documents is only one part of a much bigger picture. Oneflow automates your entire selling, hiring, and purchasing processes from A to Z. A frictionless sales, hiring and purchasing process from start to finish. From creating professional contracts using the easy-to-build templates to customizing its API to connect it with your existing applications, Oneflow is many steps ahead of most of the e-signature solutions available today. Oneflow lets you create your documents and manage them in a collaborative environment. Everyone will only see the latest version of the contract to allow easy management and quick processing. With robust searching tools, finding any old contracts is a breeze. It even gives you access to a dashboard so you can have an overview of all pending, sent, or active contracts in your organization. There are also automatic notifications to remind of when it is time to renegotiate or renew a contract. If you are looking to streamline your sales, hiring, or purchasing workflow with functionality that goes beyond e-signature creation, Oneflow is the right product for you.